1 of 4 Heat oven to 350 degrees . Place cookie dough in a large bowl. Add flour and knead in until incorporated. 2 of 4 Roll out dough to 1/8-inch thickness. 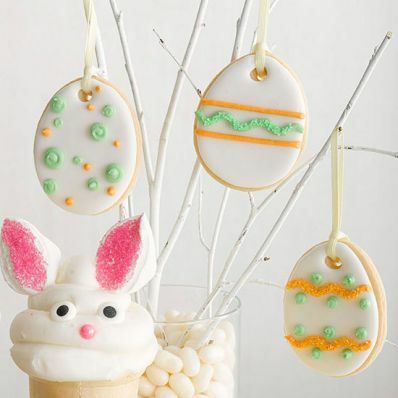 Cut out cookies with a 2 3/4-inch egg-shaped cookie cutter, re-rolling and re-cutting scraps. Transfer cutouts to 2 large cookie sheets. With a drinking straw or chopstick, make a hole in top of each cookie (so you can thread a ribbon through it). Bake at 350 degrees for 13 minutes, until set and just beginning to brown at edges. 3 of 4 Prepare icing: Combine confectioners sugar, powdered egg whites and 6 tbsp water in a large bowl. Beat with a mixer on low for 30 seconds, then on high for 4 minutes. Divide about 1 1/4 cups icing between 2 smaller bowls. Tint 1 bowl orange and 1 green. 4 of 4 Spread cookies with white icing (thinning with water if needed). Decorate cookies with colored icings. Add sparkling sugars, if desired.